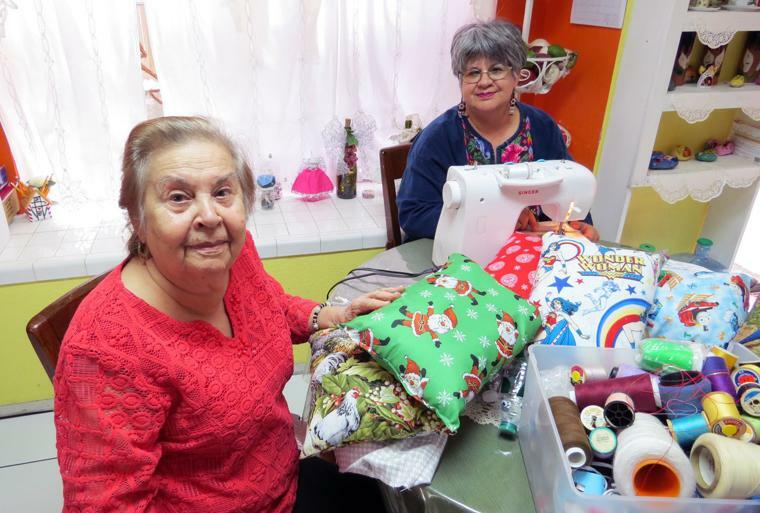 With a sewing machine, some fabric and cotton stuffing, a Brownsville mother-daughter duo has set out to be part of the humanitarian response for migrants on the border. Melba Salazar-Lucio, 61, a Texas Southmost College English professor, and her mother Maria Elena Salazar have made and donated around 2,000 pillows to groups that aid asylum-seekers. The pillows are given to immigrants dropped off at the Brownsville bus station, living on international bridges or staying at the McAllen respite center. In her mother’s home recently, Salazar-Lucio flipped through a plastic sleeve filled with letters and donations from around the country she keeps alongside receipts documenting how the funds are spent. She read off the return addresses: New York, California, Dallas, Austin. Local volunteers have come together under the name “Team Brownsville,” Salazar-Lucio said. They make care packages for migrants released from detention and take meals to those who await on international bridges in Matamoros for their chance to apply for asylum. She recalled that some living on the B&M International Bridge slept on the ground. They won’t be running out of thread any time soon thanks to donations from supporters. Family members have even opened the front door in the morning to find someone has left a box of materials, Salazar-Lucio said. They are in need of cotton and flannel but are happy to take donations of any kind for people who may be getting rid of excess sewing material, she added. “Just when we are getting low (on supplies), we get a check for $20,” she said. People who wish to get involved can contact Salazar-Lucio at (956) 434-9296 or send donations to 124 Sunshine Road, Brownsville, TX, 78521. Monetary donations can be made by check to Dr. Melba Salazar-Lucio.